I made this dish only because I purchased a frozen seafood mix and asked myself, what shall I cook with this calamari, shrimp and fish? This is how the brilliant idea of making a fishy rice happened! I was making up the recipe in my head as I went along LOL so this is an experiment meal. I added everything fishy and I was not disappointed. Growing up I remember that for some reason we ate only fish during Easter, so I was thinking up ideas of meals for Easter. When my husband tasted this, he said "this is what I want to Eat on Easter Day". Ah...no problems here, I want to east it too again. Try it and let me know what you think! Season calamari, prawn and fish flakes with salt, olive oil and add to a hot pan, stirring for 3 minutes before taking off the pan. Add a tbs of olive oil to the same pan and when it heats up, add onions and ginger, and thyme, add green, red and yellow bell peppers, also chopped carrots. Add Maggi crayfish and saute. 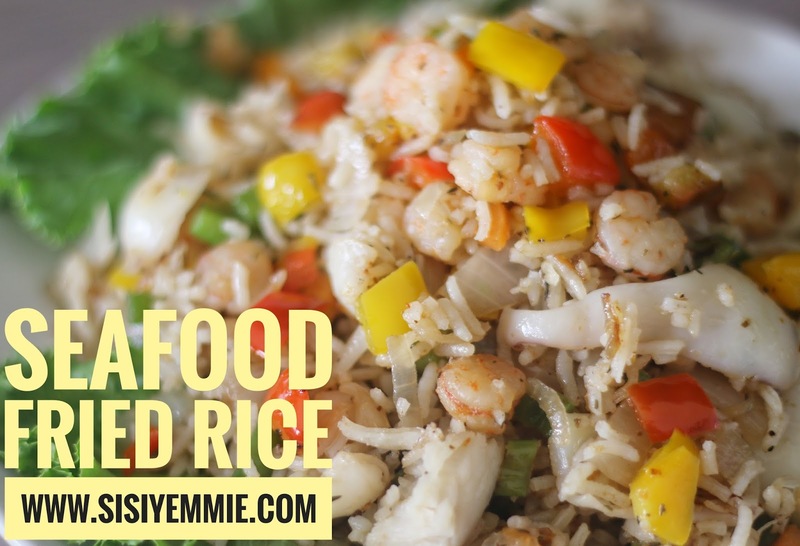 Add Seafood mix, and portion into plates so that the rice can be stir fried in batches. Add a serving spoonful of the vegetable and seafood mix in the pan, along with 2 or 3 serving spoonfuls of cooked rice. Combine and stir fry for 3 minutes. There's always something new here. Definitely will give this a try. If it's not Bashmiti rice is it still doable? I lost lots of money on MMM but thank God to 247Merger for making me recovered all the money I lost on MMM and more in less than 24 hours. To recover your own lost money too quickly rush to www.247merger.com and invest just N20,000 with them to get N40,000 back. thanks for the wornderful recipe I’m definitely going to try it for our next family gathering.